At Country Heritage Winery in LaOtto, IN, we welcome and invite everyone within the state of Indiana to taste our wine that’s locally sourced from our 42 acres of grape-growing vineyard. What sets us apart from the competition is the quality of the products we produce and the experience we provide to our customers. You can visit our Tasting Room where we offer two complimentary tastings daily. Unlimited additional Tasting Tokens may be purchased for $1 each. If you are dropping by our winery on a Saturday, you can enjoy a free tour with one of our top wine experts. Each one starts at the top of the hour, beginning at 12:00 PM and ending at 6:00 PM. You may also shop at our showroom where we feature locally made items, such as edibles, wearables, wine accessories, and gift items. Also, try our sweet and delicious locally made DeBrand Chocolates! Additionally, gift cards are available in multiple denominations. Our winery is open seven days a week. It is a great place to relax, whether on the spacious wraparound porch or in the gazebo, where you will be surrounded by eight acres of gorgeous vineyard. Constructed in our family-owned farm, Blueberry Acres, Country Heritage Winery is true to its name with more than 100 years of family legacy behind it. Its proprietors, Jeremy and Jennifer Lutter, opened the winery on April 29, 2011 and continued the “Country Heritage” tradition. Together with our winemaker Kevin Geeting, they developed our Wine Philosophy. We believe that if the fruit is great, the winemaking is easy. With meticulous care and attention to detail, we are committed to nurturing the best grapes for our wines. Though we grow most of what we produce, we supplement the yield from our 24 acres of grapevines planted in the spring of 2011 with high-quality grapes. We source all of our fruits from reputable farms in Michigan, Wisconsin, New York, Washington, and California. These grape varieties include Cayuga White, Traminette, Vignoles, La Crescent, Marechal Foch, Marquette, Norton, and Concord. Since we have opened our doors, Country Heritage Winery has created more than two dozen award-winning wines, including 2012 Indiana’s Traminette of the Year. We believe that great wine starts in the vineyard or field with quality grapes and fruit. Ultimately, we wish to give everyone the same thing we would want from a bottle. We received the Governor’s Cup from the 2017 Indy International Wine Competition, the largest scientifically organized and independent wine competition in the United States. Besides receiving this distinction, we also took home 42 medals, including 3 Double Gold, 12 Gold, 15 Silver, and 12 Bronze. Previously, we received Best of Class for our 2013 Estate Grown Marquette & Heritage Rose. 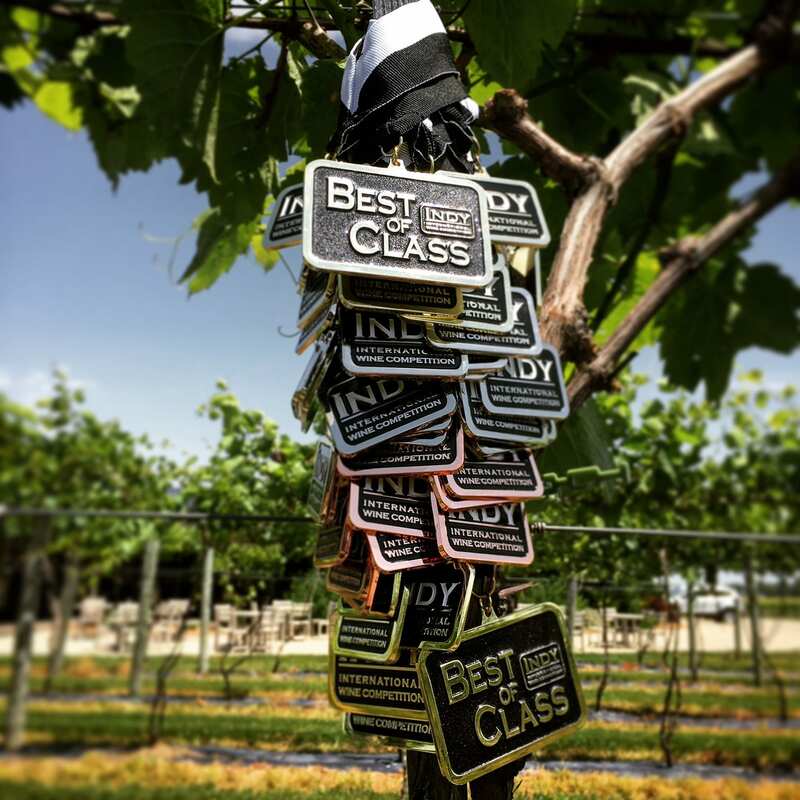 Since our inception, we have been grateful to receive 156 medals, 8 Best of Class, Indiana Traminette of the Year, and Indiana Farm Winery of the Year in both 2015 and 2016. We thank everyone on the Pursue Wine & Grape Team for putting on such a wonderful competition. We also extend our appreciation to all of our fantastic employees for making our winery great. Host your next gathering in our Event Center, and make the most of your occasion. Whether it’s a birthday, bridal shower, corporate function, reunion, or an anniversary that you are having, we would love to be a part of it. If you would like to check our availability, request a tour, or schedule your event, please give us a call at 260-637-2980 or email us at winery@countryheritagewinery.com. Country Heritage Winery does not offer discounts on rental pricing and does not host weddings and receptions. Rooms are available from Monday to Thursday only. We offer a variety of wine-themed products and souvenir items. Browse through our selection today.